Yes, you read that right. Whereas the ladies at Thinx invented an underwear that was leak-proof, moisture absorbing and odor-resistant, this latest piece of high-tech underwear actually prevents you from making a stink when you break wind. Sure, they are not exactly tackling Climate Change or curing diseases, but they must just be one of the most practical inventions to date. They are known as Shreddies, and are the brainchild of British inventor Paul O’Leary. Basically, they use a thin layer of activated carbon, a known odor destroyer, to mask the smell of gaseous secretions. The porous nature of the carbon traps the smell, leaving nothing but the smell of fresh underwear, and all you need to do to reactivate the odor-trapping abilities is to wash them afterwards. 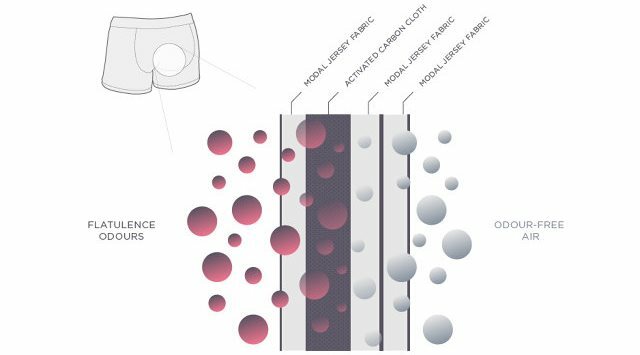 De Montfort University in the U.K. tested our new 100% activated carbon jersey cloth and presented their findings at the 86th Textile Institute World Conference. Needless to say, when the Textile Institute – the leading international authority of clothing and footwear – backs you up, you know you’re doing something right! Currently, Shreddies start at $30 for women and $45 for men. And in addition to their standard odor-blocking model, they also produce a line of underwear for people suffering from incontinence. These come with a new waterproof and breathable fabric, which has a high moisture vapour transmission rate. As to the most important question, the company was sure to address that as well on their website, saying that while their designer underwear does absorb odors, it does not muffle the sound of flatulent outbursts. Luckily, they advise people to just alter the position of their bodies to do that. How thoughtful! It’s an interesting age we live in, where underwear is capable of doing the same job as a diaper, and with odor-eliminating capabilities to boot! At this rate, we won’t need to mind our manners or toilette train ourselves at all in a few years! Uhm… But my farts don’t stink. Also, did you see my new trailer for Whiskey Delta? Quick! Send that to my youngest sister! Her farts stink something awful!